10 April 1861, Governor Thomas Overton Moore and his staff were preparing for the inevitable conflict. The Civil War had not yet begun, Fort Sumter was a few days away. But Just two days earlier, Daniel W. Adams, of the New Orleans Military Board, had notified President Davis that Union ships had conducted a reconnaissance operation in the waters off Forts St. Philip and Jackson thereby suggesting that they were preparing for an attack of sorts. Adams was a newspaper man who had once killed a man in a duel for criticizing his editorial work. Known for his directness, he did not equivocate in his message. The precognition of pending if not imminent danger from the Federal Navy began when the people of New Orleans learned that a large naval fleet had assembled and sailed from New York at the first of the month. Louisiana had seceded at the end of January, but the undertaking of adequate preparations for the defense of the city was nowhere near completion. Governor Moore was not a military man, but he and those around him recognized the need for military authority and the martialing of resources in the region. He specifically requested of the Confederate War Department that the assignment of command go to Colonel Paul Octave Hébert, who was currently in charge of artillery for the state. He had graduated first in his class at West Point—the same class as William Tecumseh Sherman and George Thomas, 1840 I believe. He served with distinction in the Mexican War, and had been elected at a very young age to governor of Louisiana. Hébert seemed a natural choice. He was from Iberville Parish, upriver between New Orleans and Baton Rouge, so he knew the territory and was well acquainted with its people. “We are disorganized, and have no general officer to command and direct,” he wrote. He added the nor did his state have sufficient troops to defend as he had had to send so many men away to other parts of the new Confederacy. As a politician, Moore also knew too well the importance of bringing money into the equation. “I doubt the policy of draining this place of troops to be sent to Pensacola. They are needed here, especially if this place be selected to collect revenues.” He offered that supplying funds to the new government would be difficult if they were staring down the barrels of Yankee gunboats. Seemingly, however, the leadership in Montgomery didn’t feel the same level of agitation that came from New Orleans. Thinking he would find a sympathetic ear, Moore had also shared his anxiety with the Confederacy’s Attorney General, Judah P. Benjamin, a fellow Louisianan. They were well acquainted and considered each other friends, yet Benjamin still insisted on the importance of Pensacola and let Louisiana’s governor know that “the fears of our people are without cause.” He had conferenced with President Davis and afterwards assured Moore that the Federal warships were not destined for New Orleans. The sense of urgency heightened in late May 1861 when Union ships seized some commercial ships and officially declared that the blockade was in effect. The USS Brooklyn commandeered a large shipment of Brazilian coffee destined for New Orleans and soon after the Powhatan seized an export vessel loaded with rice and other products leaving for the Caribbean. Answer to the request for a military commander finally arrived at the end of May—almost two months later—in the form of General David E. Twiggs, the most senior officer in Confederate Service. 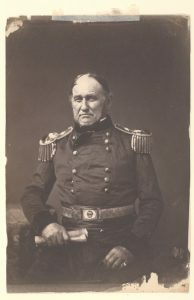 A Georgian born in the previous century, Twiggs had fought as an officer in the War of 1812 and had already attained the rank of and served as a brigadier general in the Mexican War, some twenty years prior. Elderly though he was at age 71, he was sufficiently experienced to recognize that the defenses were inadequate. He was fully aware of the Louisiana infantry and artillery battalions that were departing for Virginia and the transfer of men and materiel to points such as Pensacola, but after some deliberation, he set about attempting to rectify the situation as best he could. 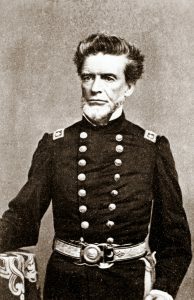 Unfortunately, Twiggs’ infirmities hampered his ability to personally inspect and make recommendations for all of the forts, batteries and defensive positions that guarded the many approaches to New Orleans. There existed the outer line of defenses, that if properly fortified and supplied could pose a formidable obstacle to the enemy. Still, two other questions required resolution, the inner defense line and the shoring up and construction of a barrier to prevent the enemy’s passing of Forts Jackson and St. Philip. General Beauregard had addressed these issues while still in town awaiting assignment some months earlier, yet to date little or nothing had been accomplished. “My force is well disciplined, armed, uniformed and organized,” he was ready leave “at once” but basically said his hands were tied by Governor Moore who would allow no ordnance to leave Louisiana. Thus Trudeau could take his men if they willingly complied, but they effectively would be unarmed. Moore agreed that stationing Confederate troops on the island was important, Trudeau was ready to take his men there, Walker gave the government’s official approval. Yet there was no movement. The impasse became a stalemate when the governor declared that Trudeau had neither the authority nor permission to take his men and arms out of the state of Louisiana. Moore emphasized that he had never refused a request from Trudeau, who curiously had never “asked for anything.” He even went so far as to suggest that in his opinion, Trudeau’s men were “a myth.” At that point, Secretary Walker revoked the orders given to Trudeau to occupy Ship Island. The sovereignty of the State over Federal authority, such a major issue in the development of the Secessionist movement, had won out. Twiggs may have deemed this a good initial step, but much more was necessary. In the midst of the lethargy that seemed to have settled over Louisiana since secession, the leaders of New Orleans decided to take the initiative and prepare proper defenses in case of enemy assault. The New Orleans Common Council, General Twiggs and other leaders from the region agreed in early July on a plan for the defenses and met with the governor who gave his consent to proceed. The plans required, besides ordnance, the possible acquisition of certain properties on either side of the Mississippi River. All parties were aware of the ramifications of commandeering private property, but wartime brought new priorities. Despite the threat of military invasion, this proved to be too much for the landowners and, in a rare nod to Federal government authority, Governor Moore revoked his permission three weeks later. Any further preparations must have the approval of the War Department before he would allow them to go forward. The city was at yet another standstill with regard to its defenses. The northern blockade began to take serious effect and the people of New Orleans increasingly experienced the privations that accompanied it. Perhaps most noticeable was the absence of coffee, a morning staple in the city. Although there was shortage of goods coming in to the city, there was an increase in the manufacture of armaments. The Leeds foundry had retooled and was producing cannon, including the large columbiads so effective in confronting a siege by water. Other small but enterprising industrialists came up with efficient methods of mass producing bullets, still others bayonets and even torpedoes (what we today would refer to as underwater mines). Finally, on 30 September the report arrived that verified the completion of the barrier across the river at the forts. The combination chain and moveable barges, recommended by General Beauregard months earlier, that would impede any invasion force coming upriver to threaten the city. In the meantime, just as citizens were feeling that the defenses were coming into place, the Confederates abandoned Ship Island. At this point the clamor arose among city leaders for the replacement of Twiggs. Simultaneously Confederate leaders in Richmond pondered his usefulness. Curiously, President Jefferson Davis chastised the people of New Orleans for letting things get to such a state. Twiggs had emphasized back in June the importance of Ship Island and stated that with guns and men he could defend the coast. He anticipated an attempt to invade the coast would come that fall and told Secretary Walker as much, “anticipating this I think more troops should be on the coast.” If the river should fall into the hands of the “Black Republicans,” his general term for Lincoln’s northern forces, “this city will be in very critical condition.” Now faced with a potential threat from the Union gunship, Massachusetts, Twiggs ordered the evacuation of the island. This was enough for Louisiana’s political leaders to lose confidence and pull their support for the aged commander. 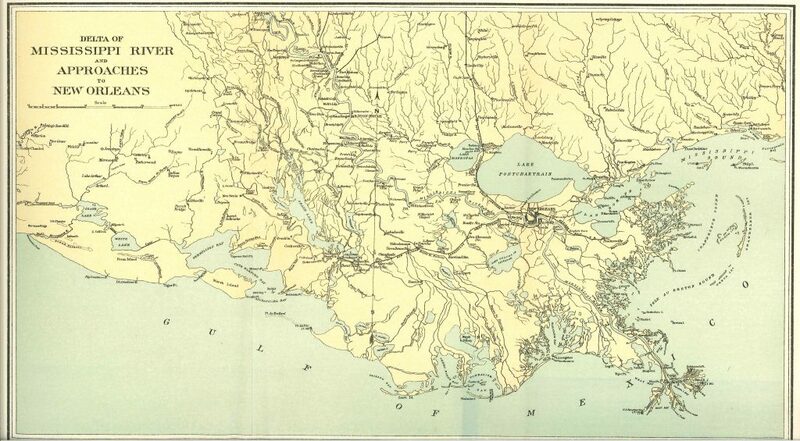 Lower Mississippi River and surrounding region. In New Orleans the current and former governors both expressed their concerns and forwarded them to Jefferson Davis. Former governor A.B. Roman told of “the feeling of uneasiness and apprehension” that permeated the city and state. He told of the lack of preparedness and leadership and singled out Twiggs “in spite of his good intentions.” The General’s “infirmities . . . confine him to his armchair, [and] disqualify him completely for the situation he holds.” Governor Moore basically echoed the same thoughts to Richmond, and President Davis, making sure to let all know that New Orleans should have let him know sooner, notified all involved that he was assigning General Mansfield Lovell to New Orleans. Lovell would be reporting to General Twiggs in mid-October per his orders of 25 September. Twiggs himself knew his limitations and sent his request to be relieved to Richmond on 5 October, “My health will not permit me to take the field. I would like an active and efficient officer to be sent to relieve me.” Benjamin complied and told him to await Lovell’s arrival. Faced with the limitations of his age, already at 71 years, General Twiggs soon left active service and retired to his home near Augusta, Georgia. He died there in July of the following year, when New Orleans was already in Union hands. Quotations are from the Official Records and newspaper accounts. Please email mark@markbielski.com for exact citations.